Fig 1 - Uranium-series ages (with 2σ error bars) obtained from the structures. Yellow, ages of the calcite covering the burnt bone in the accumulation structure E; red, ages obtained from the stalagmites covering the structure (regrowths) and representing a minimum age for the structure; blue, ages obtained from the stalagmites used by humans to build the structure (speleofacts) and representing a maximum age for the structures; black, age obtained from the flowstone partially covering the inside area of the main structure. The age of the structures is situated between 175.2 Â} 0.8 thousand years (ky) and 177.1 Â} 1.5 ky. The calcite covering the burnt bone is dated to 180.9 Â} 20.3 ka, indicating a minimum age of the bone and adding evidence of earlier human presence in the cave. 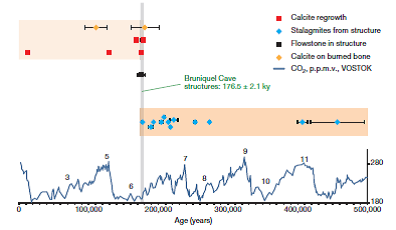 The general climatic context is given by the CO2 concentration variation (expressed in p.p.m.v., low right y xis) extracted from the Vostok ice core record30 (black numbers indicate major marine isotope stages). Very little is known about Neanderthal cultures, particularly early ones. Other than lithic implements and exceptional bone tools, very few artefacts have been preserved. While those that do remain include red and black pigments and burial sites, these indications of modernity are extremely sparse and few have been precisely dated, thus greatly limiting our knowledge of these predecessors of modern humans. Here we report the dating of annular constructions made of broken stalagmites found deep in Bruniquel Cave in southwest France. The regular geometry of the stalagmite circles, the arrangement of broken stalagmites and several traces of fire demonstrate the anthropogenic origin of these constructions. Uranium-series dating of stalagmite regrowths on the structures and on burnt bone, combined with the dating of stalagmite tips in the structures, give a reliable and replicated age of 176.5 thousand years (±2.1 thousand years), making these edifices among the oldest known well-dated constructions made by humans. Their presence at 336 metres from the entrance of the cave indicates that humans from this period had already mastered the underground environment, which can be considered a major step in human modernity. The attribution of the Bruniquel constructions to early Neanderthals is unprecedented in two ways. First, it reveals the appropriation of a deep karst space (including lighting) by a pre-modern human species. Second, it concerns elaborate constructions that have never been reported before, made with hundreds of partially calibrated, broken stalagmites (speleofacts) that appear to have been deliberately moved and placed in their current locations, along with the presence of several intentionally heated zones. Our results therefore suggest that the Neanderthal group responsible for these constructions had a level of social organization that was more complex than previously thought for this hominid species. Authors : J. Jaubert, S. Verheyden, D. Genty, M. Soulier, Hai Cheng, D. Blamart et al.